​If you are a student of staff member and want to take some time away from busy city life and studies / work to enjoy some peace, prayer and quiet time by the sea, we have weekend retreats coming up soon at St. Joseph's Prayer Centre, Freshfields. If you would like to get more information or secure a place please speak to Sr Cecilia in the Chaplaincy Office between 9am-3:30pm Monday-Friday. Every first Friday of the Month . . . 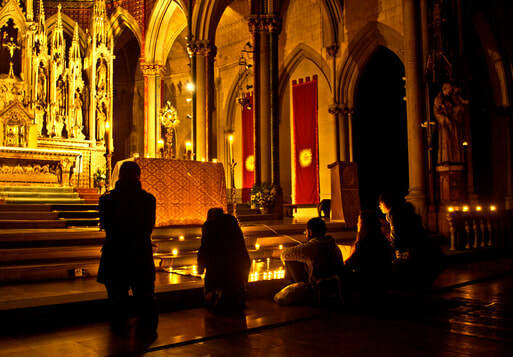 The church remains open from 7:30pm - 10pm, bathed in just candlelight. On the altar is the exposed Blessed Sacrament. Live music is softly played in the background. Our volunteers are outside, in pairs, just inviting passers by to come in and light a candle. The response to the invitation varies, but a surprising amount of people come in.